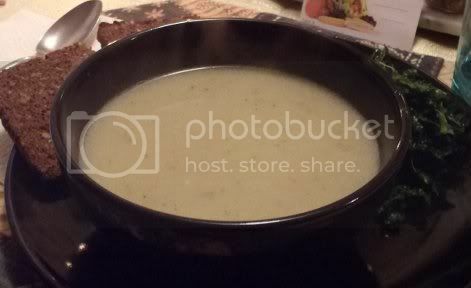 Before I went vegan, one of my favorite soups was potato leek from the Amy’s Kitchen brand. It was one of the few things I was willing to risk a lactose intolerance reaction in order to eat. 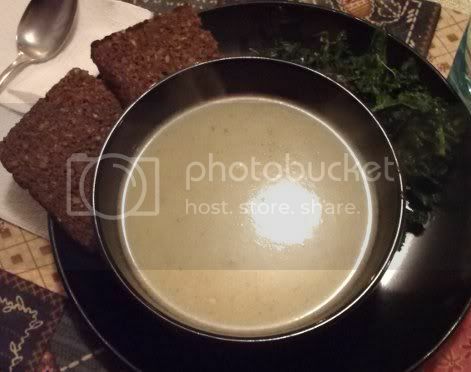 But butter and cream pretty much became dangerous after a while, so even before going vegan this soup was a big no-no. That didn’t stop me from loving it and missing it, so last week I picked up a huge leek at the store and decided to try my hand at making my own. At first I thought I’d just follow a recipe from one of my cookbooks, but this was one of those instances where I turned up plenty of potato soup recipes, but no potato leek soup. Thus, it was time to start inventing. This recipe is pretty easy and comes together fast if you cut the potato into small enough pieces. An immersion blender helps a lot, too. (I can’t express how happy I am that my mom and I finally bought one!) I removed the oil (or, in this case, butter) from the original soup and used coconut milk instead of cream. I like the light kind, but you can use full-fat if you prefer. 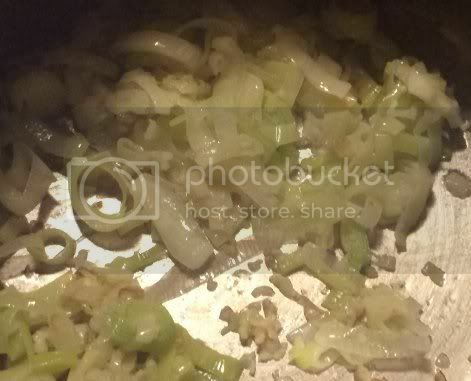 1) Place the garlic and leeks in a large soup pan or stock pot over medium heat. Cover and cook until soft, stirring occasionally, about 5 minutes. Add splashes of water to the pan to keep the veggies from sticking, if necessary. 2) Add the potatoes and stir to coat. Add the broth and spices. 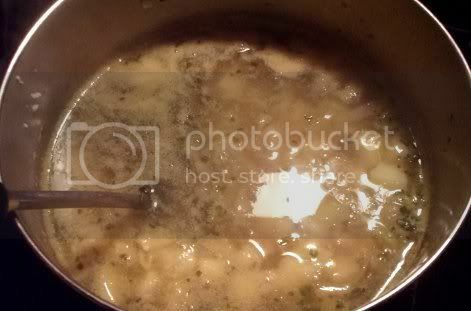 Bring to a boil, reduce heat to medium-low, and simmer, covered, until the potatoes are soft, 15-20 minutes. 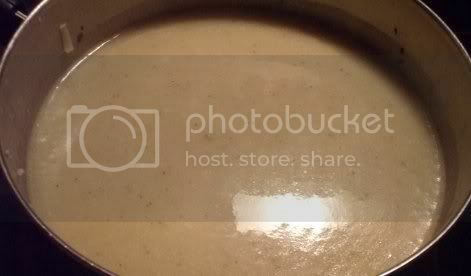 3) Using a blender or immersion blender, puree the soup until smooth. Add the coconut milk and simmer uncovered 10 minutes more to blend the flavors. Taste and adjust seasonings. Serve hot. Incidentally, the soup is also gluten-free and soy-free! It serves up well with a dark green veggie and bread on the side.